After what has seemed like a dreary couple of weeks, we will finally experience some pleasant, Spring-like weather this week. While we can't promise to stay dry the entire week, we should only see rain on one/two day(s), which that is still even semi-questionable. All in all, I hope you were able to find your sunglasses over the weekend because you will need to keep them around this week! In terms of our temperatures this week, and how this compares to "normal", we will actually be a few degrees below normal to start the week and finish off the week a few degrees above normal. "Normal" for mid-March is right around the mid-60s, which we should hang around near 60 the first half of the week before reaching into the upper 60s to near 70 by this weekend. All in all, temps in the 60s sounds pretty nice to me. We have had a beautiful day today and this will continue into the evening and overnight hours. For this evening, temps will slowly begin to fall back into the 50s under a mostly clear sky. Overnight, we could begin to see a few more clouds fill our skies with temps dipping down to near 39. Tomorrow, expect for a few of these overnight clouds to hang around throughout the day, leaving partly cloudy skies behind. While a few clouds will fill the sky, there will be plenty of sunshine to help temps to rise up to 59 for our high. Besides a few more clouds, Tuesday appears to be a near copy to Monday. While some clouds will fill the sky, there will be ample sunshine to make it feel pretty nice outside. Highs will reach near 50. By the middle of the week, we will begin to see a slight increase in cloudiness, with a chance of showers. A very weak "cold" front is expected to move through the area, bringing enough energy to maybe bring a few showers with it. Some models, like the GFS, want to bring showers through the area sometime on Wednesday, while the Euro wants to hold these showers until the AM hours on Thursday. Regardless of the timing differences, it does look like we may get a few showers sometime between Wednesday and Thursday. Highs both days look to be in the low to mid 60s. By Thursday afternoon, any shower chances should have moved along, leaving partly cloudy conditions for our afternoon and evening hours. We will begin to get a taste of warmer temperatures by Friday heading into the weekend. 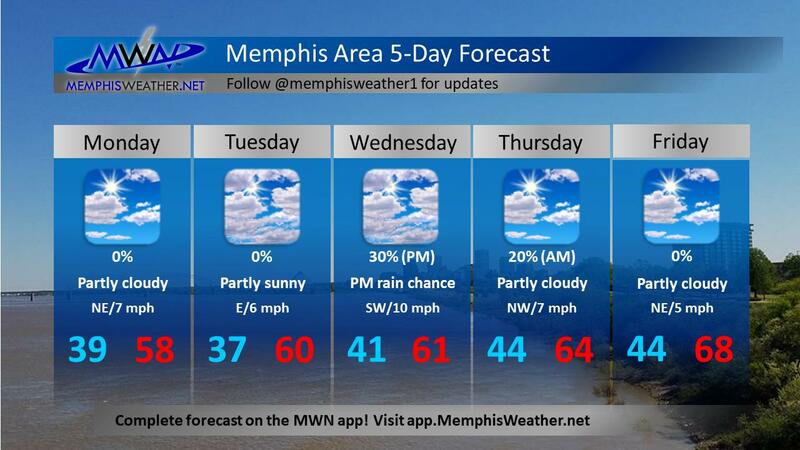 High pressure will build back into the Mid-South following Wednesday/Thursday's weak frontal passage. This high pressure will help to keep showers out and sunshine in. Highs will reach into the upper 60s to near 70 this upcoming weekend, with overnight lows falling to the mid 40s. With sunshine and just above average temps, I don't think we could ask for a more pleasant weekend. If you have plans for this upcoming weekend Friday and Saturday look like the "better" days to do so. While it is still a week away, models are hinting at some showers next Sunday. Worth mentioning if you are weighing doing something outdoors Saturday vs. Sunday, in which case I would make plans for Saturday rather than Sunday. As the week progresses, we'll keep an eye on Sunday's shower and thunderstorm chances.